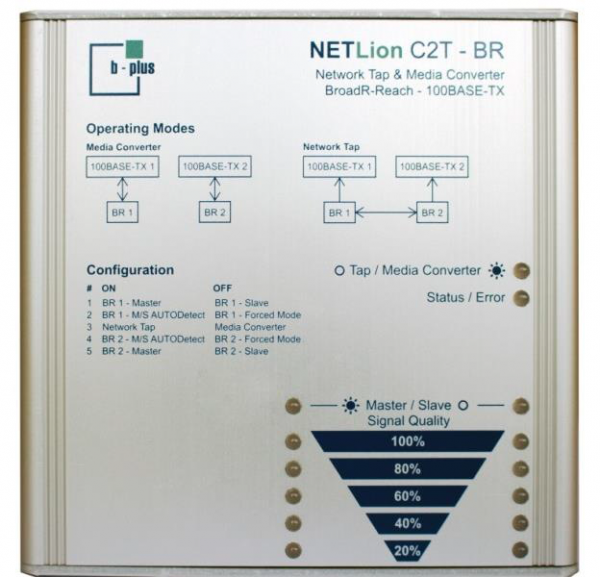 Produktinformationen "b-plus B18000-NEL-001-0002 - NETLion C2 - BR"
NETLion is an automotive Ethernet development tool for bidirectional conversion and decoupling of automotive Ethernet (BroadR-Reach®). In addition the media converter and Ethernet tap can diagnose the BroadR-Reach® connection quality, status and errors. Up to two BroadR-Reach® Signals are converted to 100BASE-TX Ethernet, which is common in the IT area. During the operating mode Network Tap data is decoupled of both BroadR-Reach® line ends and transmitted on the two 100BASE-TX interfaces. The network tap operates on layer 1 and inserts a small symmetric and constant delay of about 1.2 µs. Discover errors With the NETLion Configurator Software you can see signal quality, occurring errors, as well as the status of the data traffic. Additionally NETLion includes a filter for ADTF (Automotive Data and Time-Triggered Framework), where you can acquire and view the diagnosis data. NETLion has a Configuration Ethernet Port where you can get this data. For use in the automotive area NETLion can be used for the development desk and even for use in harsh environments. Power supply and operating temperature range are designed for the permanent integration in such environments. Weiterführende Links zu "b-plus B18000-NEL-001-0002 - NETLion C2 - BR"
Kundenbewertungen für "b-plus B18000-NEL-001-0002 - NETLion C2 - BR"